With no transfer paper available here, I resorted to the usual method of transferring with yellow carbon (graphite) paper. I made sure I used an old one,since I did not want too dark lines which will not wash off. But the transfer ended up to be very feeble and I had to use my water soluble marker pen to highlight the really faint lines. Atleast I know for sure that these will wash off . 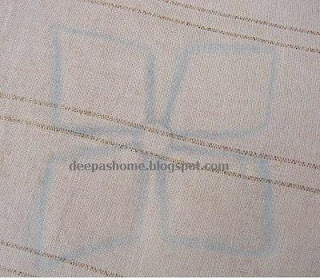 Besides Heather of A cherished life did tell me that the marks will disapper if I just spray water on it . Once the transfer and highlighting was done, the outlining work started. 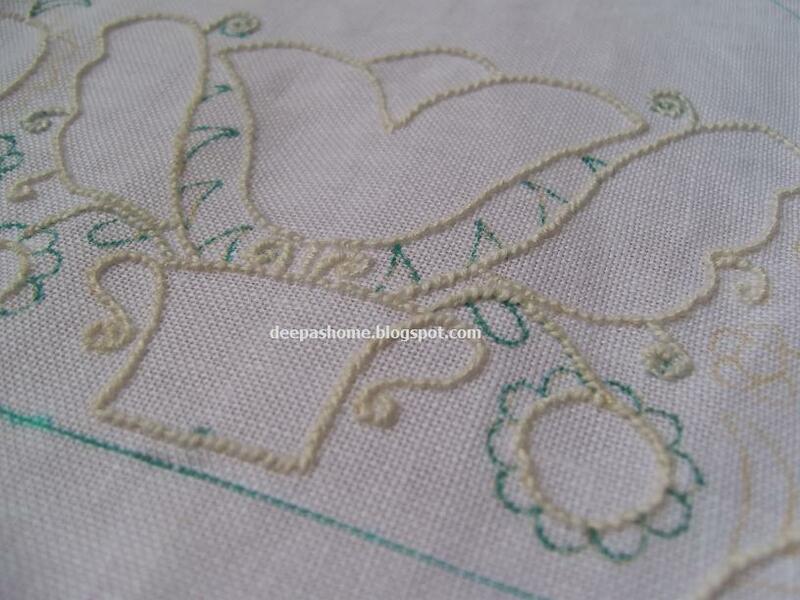 In Schwalm, coral knots and chain stitches are predominantly used for outlining. In this case, I outlined with coral knots using Anchor Coton a Broder #16 thread. It's looking very interesting so far, Deepa. I'm looking forward to seeing the progress. Making duplicates on four sides gets really boring by the time the last one comes around. Maybe you could work each step on all four sides before going on to the next step. Then when you've finished the last step, you're finished with the whole thing! Deepa, You are doing very well. I cant see them very clearly, but your coral knots look so even. Does your design have Double Knot Stitch. I love this one it just lifts the design. If so does the book tell you that the height of the stitch is governed by the closeness of the next "bite" to the previous finished stitch and the number of threads you take for it. 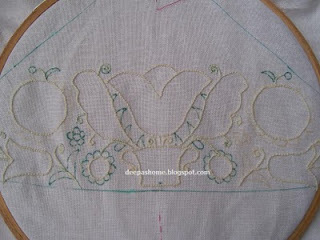 The "bite is when you begin the following stitch and take the needle down above the line and up under the line. I might have to email you a pic if this is not clear. This is just gorgeous Deepa... can't wait to see you doing more of this. Hugs. Oh Deepa! I feel so guilty for leaving my Schwalmwork left aside... 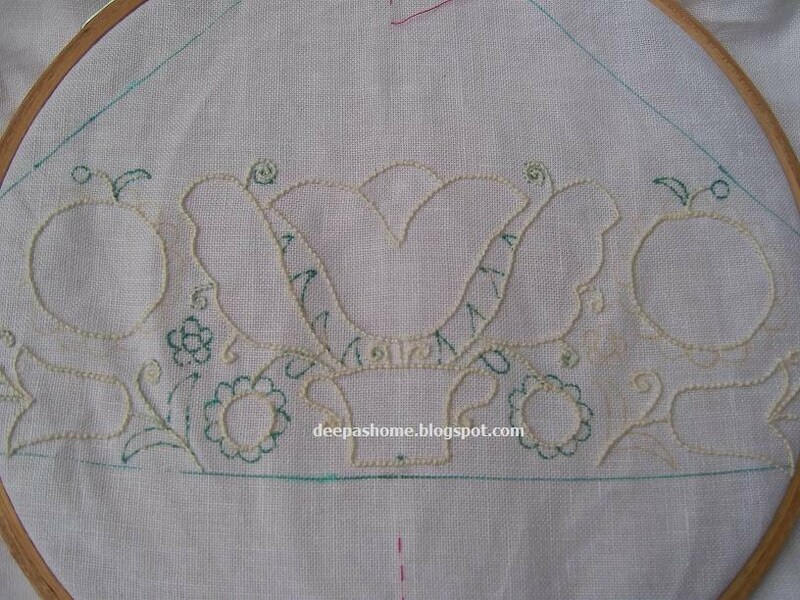 I have almost the four sides complete but not the fillings only the coral knots, chain and satin stitches. I have to practice the filling stitches I've never made - they intimidate me a little bit... although Luzine'step by step are great. She is a lovely lady.